Rapid growth in the use of credit derivatives is also posing financial regulators with a number of issues relating to transparency (Graph 11). In some cases, the balance sheet data received from financial institutions are becoming less meaningful, as credit exposures are taken on or divested through derivatives. The growth of credit derivatives markets has also meant that it is less clear where the credit risk actually resides, and how those holding this risk will react in a less benign environment. There is now such creativity of new and very sophisticated financial instruments . . . that we don?t know fully where the risks are located… We are trying to understand what is going on?but it is a big, big challenge. Goodness knows it’s not easy to understand the maze of financial structures that appear to be unwinding. They were created by wizards of complexity: youthful financial engineers trained to exploit cheap money and leverage and who have, until the past few weeks, never known the sting of the market’s lash. Although has been estimated that the amount of bad debt (derived from sub-prime loans gone bad) losses could amount from US$100 billion to US$200 billion, nobody knows where they are. It may be possible that your pension fund may be sitting on a time-bomb and still not aware of it! All these ?wonders? of the modern financial system, namely debt and derivatives, enabled the creation of a complex tangled mess of linkages between participants (e.g. financial institutions, funds, investors, banks, etc). The former (debt) allows the use of leverage while the latter (derivatives) allows risks to be transferred like a hot potato from one hand to the other. That sounds good, does it? But what if the derivative that you used to hedge your risks become useless because the counter-party of that derivative could not honour its obligation? In that case, you may not be able to honour your obligation against another party. Imagine repeating this scenario countless times over, forming a yarn of complex entanglements. What if a small section of the yarn catches fire? What will happen to the yarn as a whole? There are those who said that there is so much liquidity in the world that asset prices can never fall. We suspect they are wrong. If liquidity is largely made up of debt and derivatives, it is very possible for them to disappear (see Spectre of deflation). In our previous article, How does a central bank ?set? interest rates?, we explained how the central bank set the interest rate. Today, we found an article from the Reserve Bank of Australia (RBA), Central Bank Market Operations, which explained central bank market operations (to set the target interest rate) in the light of the recent financial market instability. In our earlier article, Consumers paying for the implosion of dumped risk, we mentioned about the ?cockroach theory:? … if you see one cockroach in the kitchen, then there must more of them somewhere else. In the same way, if we see some of these crises in hedge funds coming to light, then there must be more of such rot somewhere else. What seemed to be worrying people was that, while the US Fed had calculated the losses in the sub?prime market as being potentially as high as US$100 billion, only a few billion of losses had been announced by investment funds. This naturally led market participants to question who was sitting on the prospective losses, and what this meant for the creditworthiness of market counterparties. Investors became much more risk?averse and banks severely curtailed their lending to each other, causing gridlock in the money market. The process spread quickly because once banks started to worry that others may stop lending to them, they in turn stopped lending to others. For those who are interested, it is a good read for learning purposes. For those who aren’t interested, it is a rather dry and boring article. The red line shows where we are right now. 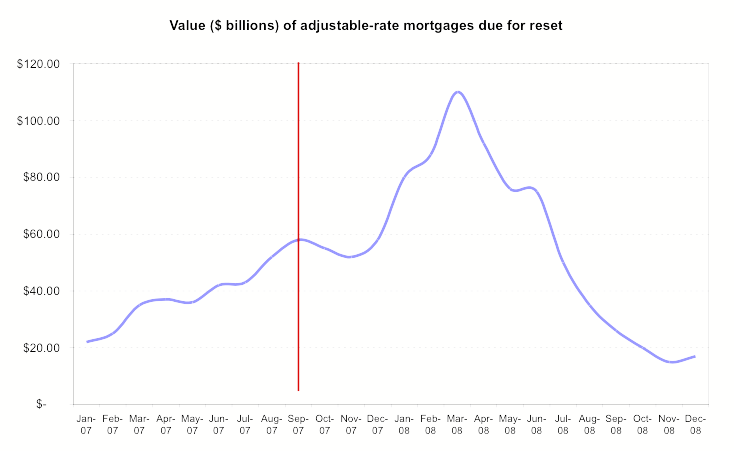 As the graph shows, there are going to be more adjustable rate mortgages in the US that will have their mortgage rates reset in the coming months. That is, a lot more home loan borrowers will find that their mortgage rates will revert from the ?honey moon? rate to the standard rate. Therefore, more people are going to find that their mortgage expense will shoot up suddenly. When this happens, we can expect the rate of foreclosures and home loan debt defaults going to rise in the US. With the financial system already wobbly, it is going to further destablise in the months to come. In a move that could help the largest U.S. mortgage lender survive a crisis that’s rocking the home-loan industry, Bank of America said late Wednesday it invested $2 billion in convertible preferred securities of Countrywide.. The nonvoting securities pay an annual interest rate of 7.25%. Where does Bank of America gets its money? With the banks getting suspicious of each other’s exposure to bad debt (e.g. sub-prime debt), they stopped lending to each other (see How does liquidity dry up?). Thus, the Fed stepped in to become the lender of last resort. Not only did the Fed cut its discount rate by 0.5%, which is the rate that banks can borrow from it, it also lowered its lending standards by accepting dubious sub-prime mortgage debts as collaterals (which is pretty much worthless as judged by the financial market). The Fed, with its license to print money, need not worry about the quality of the collaterals that it borrowed or whether the banks could actually repay the loans. J.P. Morgan, Bank of America and Wachovia said in a joint statement that they each borrowed $500 million, including some on a term basis, at the discount window. So, 25% of Bank of America’s investment in CountryWide comes from the Fed! … Goldman Sachs’ Global Alpha quant fund lost 27% of its value had lost 27 percent of its value this year because its computers failed to anticipate what the firm called “25 percent standard deviation moves” or events so rare Goldman had seen them only twice before in the firm’s history. For those who do not know what a quant fund is: it is basically a fund in which computers and mathematical models take over the decision-making process. For those of us who had already read Nassim Nicholas Taleb’s provocative book, The Black Swan: The Impact of the Highly Improbable , this is hardly surprising. As we said before in How the folks in the finance/economics industry became turkeys?Part 2: The Bell curve, that great intellectual fraud, using complex mathematics to make automatic investment decisions is not ?scientific? at all?in fact, it is pseudo-scientific. In this example, using pseudo-science can have devastating consequences to your financial well-being. So, beware of salesman touting funds that utilises mathematics so complex that only a genius can understand. Chances are, it is another case of obscurity through complexity. Why was the US dollar rising as Aussie stocks were falling? Over the previous weeks, stock prices around the world had been falling. The Australian stock market is no exception. Strangely, in reaction to the tumbling of stock prices, the US dollar rose against many major currencies except the Japanese yen. The rise of the Japanese yen against the US dollar can be explained by the reversal of the yen carry trade (see Another source of potential financial crisis?reversal of yen carry trade). But what about the rise of the US dollar? 1. The US dollar is rising because the market turmoil prompted a flight to the ?safety? of the US dollar. 2. The US dollar is rising because it is part of the reversal of the yen carry trade. 3. A lot of debt (e.g. margin lending for hedge funds) is denominated in US dollars. The credit problems in the US resulted in a surge in the demand for US dollars to repay those debts. Thus, to raise those US dollars, funds had to sell whatever financial assets that they can get their hands on. For overseas assets (e.g. Australian stocks), this means selling them and buying US dollars with foreign currencies (e.g. Australia dollar). Of the three theories, we feel that the first one is most likely to be wrong. In these circumstances, although recent data suggest that the economy has continued to expand at a moderate pace, the Federal Open Market Committee judges that the downside risks to growth have increased appreciably. The Committee is monitoring the situation and is prepared to act as needed to mitigate the adverse effects on the economy arising from the disruptions in financial markets. In other words, the Fed is fearing that whatever is happening in the financial side of the economy may spill over into the real side of the economy (see Analysing recent falls in oil prices?real vs investment demand for our explanation of the difference between the real and financial sides of the economy), pushing the US economy into a recession. If this happen, it is possible that a global slowdown will ensue. Back in March this year, we already expressed our expectation that they will be doing this (see Money printing operations begin). How should we interpret their action? Is the Fed merely taking ?preventive? measure or are they panicking? Anyway, we believe that Friday’s stock market rally (in the US) is a good opportunity to liquidate any existing holdings of stocks. Is China ‘sweating’ less and ‘thinking’ more? It all began with the outsourcing of manufacturing to the East. This common myth was often believed in the West: They sweat, we think. The assumption was that we will push the base, labour-intensive and low-level jobs to the East, while we concentrate on the more capital-intensive, high-level, technologically advanced and value-added jobs. It is this kind of complacency that we wish to shake off. As the West manufacture less and less, its manufacturing industries got more and more hollow. As the manufacturing industries migrated to the East, technology hitched a ride along as well. As the East manufacture more and more, they learn from us more and more. As they learn more, they moved up the technological ladder, create better products and move up the value-added chain. With the wasteful and spendthrift ways of the West, more jobs get outsourced to the East to protect corporate profits while the real wage of West stagnate and even decline. As the trend continues, Western skills, know-how, capital and industries get increasingly eroded. This erosion is a portent for the eventual loss of wealth by the West. China has seen a sharp increase in requests for patents, according to the UN’s intellectual property agency. Today, one of our readers asked this question: how does a central bank ?set? interest rates? To answer this question, we will look to the Reserve Bank of Australia (RBA) as an example. For this, we will get the answer straight from the horse’s mouth (RBA), which can be found in How is Monetary Policy Implemented? on their web site. First, we have to understand that there are many kinds of interest rates, which can be categorized into either short-term interest rates and long-term interest rates. An example of a long-term interest rates include the 10-year Commonwealth Treasury bond yield. An example of a short-term interest rate includes bank bill rates. … the rate charged on overnight loans between financial intermediaries. … has a very strong influence on other interest rates, and therefore helps to set the level of short-term interest rates in the wider economy. … its financial-market operations and it functions as the policy instrument. … has the task of maintaining conditions in the money market so as to keep the cash rate at or near an operating target decided by the Board. If the Reserve Bank supplies more exchange settlement funds than the commercial banks wish to hold, the banks will try to shed funds by lending more in the cash market, resulting in a tendency for the cash rate to fall. Conversely, if the Reserve Bank supplies less than banks wish to hold, they will respond by trying to borrow more in the cash market to build up their holdings of exchange settlement funds; in the process, they will bid up the cash rate. Basically, the RBA ?sets? interest rates by adjusting the money supply. This implies that the central bank cannot control both interest rates and money supply simultaneously?it can control either one or the other but not both. Recommended reading for this article: What makes monetary policy ?loose? or ?tight??. You are currently browsing the Contrarian Investors’ Journal blog archives for August, 2007.